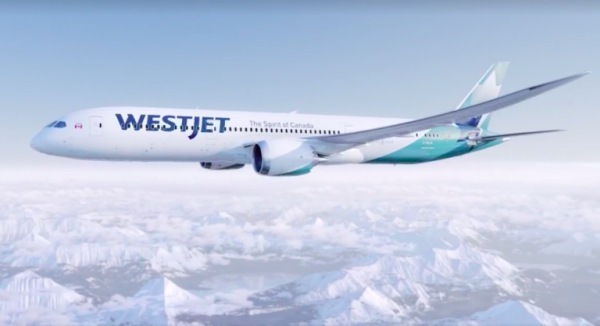 Canadian low-cost carrier WestJet has unveiled its new Boeing 787-9 Dreamliner livery, logo and cabin interior including the airline’s first-ever business class cabin. The reveal is part of WestJet’s lead-up to the arrival of its Boeing 787-9 Dreamliners in early 2019. “The introduction of Boeing’s 787-9 Dreamliner, a state-of-the-art aircraft, is the dawn of a new era for WestJet and the next step in our transformation to a global network airline,” said Ed Sims, WestJet president and CEO. The WestJet Boeing 787-9 Dreamliner features a three-class cabin including business class seating, premium economy and economy seating. Drawing from Canadian themes, the cabin interior welcomes guests with a rich color palette: a soothing alpine lake blue in Economy class; aurora inspired shades and tones in Premium Economy; and in Business Class, luxuriously rich earth tones inspired by the splendor of Canadian summers. 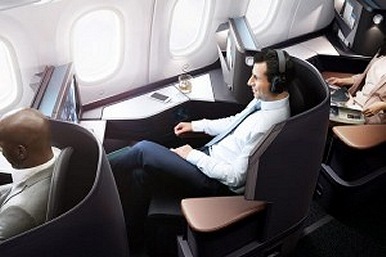 Business Class will feature touchscreen service and on-demand dining that allows the traveler to define exactly how they like to fly. When it’s time to relax and fully unwind, lay-flat mattresses, bedding and turn-down service will offer WestJet guests the opportunity to enjoy a tranquil flight. In addition to the updated stylized Maple Leaf on the aircraft tail, another nod to WestJet’s heritage is in the form of the Canadian flag appearing at the front of the aircraft. The new livery will also marry both of Canada’s official languages with, “The Spirit of Canada” appearing on one side of the aircraft and the French translation, “L’esprit du Canada” on the other, both extending across the middle of the aircraft fuselage. The livery will gradually appear across WestJet’s entire fleet as new aircraft are delivered later this year and as aircraft are repainted in their normal cycle. The Boeing 737 MAX-8 will be the first aircraft in the new livery appearing in June. This summer, WestJet’s growing fleet will operate an average of 777 daily flights to 90 destinations. The airline recently announced its first foray to the European mainland with daily direct flights between Halifax Stanfield International Airport (YHZ) and Charles de Gaulle Airport (CDG) in Paris starting May 31.